"Wetland" is a generic term for all the different kinds of wet habitats--implying that it is land that is wet for some period of time, but not necessarily permanently wet. Wetlands have numerous definitions and classifications in the United States as a result of their diversity, the need for their inventory, and the regulation of their uses. This article provides an overview of wetland definitions and classification systems of major wetland types in the United States. It also introduces the U.S. Fish and Wildlife Service (FWS) classification system (Cowardin and others, 1979) that is used throughout this volume. Cross sections of some typical wetland landscapes and the position of the wetland relative to specific topographic features are shown in figure 14. Figure 14. Cross sections of selected wetland landscapes showing typical positions of wetlands relative to topographic features. All areas considered to be wetlands must have enough water at some time during the year to stress plants and animals that are not adapted to life in water or saturated soils. A variety of wetland plant communities and soil types have developed in the United States because of regional differences in hydrologic regimes, climate, soil-forming processes, and geologic settings. Consequently, many terms, such as "marsh," "bog," "fen," "swamp," "pocosin," "pothole," "playa," "salina," "vernal pool," "bottom-land hardwood swamp," "river bottom," "lowland," and others are applied to different types of wetlands across the country. Wetlands have been defined for specific purposes, such as research studies, general habitat classification, natural resource inventories, and environmental regulations. Before the beginning of wetland-protection laws in the 1960's, wetlands were Broadly defined by scientists working in specialized fields (Lefor and Kennard, 1977). A botanist's definition would emphasize plants; a soil scientist would focus on soil properties; and a hydrologist's definition would emphasize fluctuations of the water table. The FWS developed a nonregulatory, technical definition that could have several uses, ranging from wetland protection to scientific investigations. This definition emphasizes three important attributes of wetlands: (1) hydrology--the degree of flooding or soil saturation; (2) vegetation--plants adapted to grow in water or in a soil or substrate that is occasionally oxygen deficient due to saturation (hydrophytes); and (3) soils--those saturated long enough during the growing season to produce oxygen-deficient conditions in the upper part of the soil, which commonly includes the major part of the root zone of plants (hydric soils) (Cowardin and others, 1979; Tiner, 1991). To supplement this definition and to help identify wetlands in the United States, the FWS prepared a list of wetland plants (Reed, 1988). In addition, the Soil Conservation Service 1 developed a list of hydric soils (U.S. Soil Conservation Service, 1991). On the basis of plant and soil conditions, wetlands typically fall into one of three categories: (1) areas with hydrophytes and hydric soils (marshes, swamps, and bogs); (2) areas without soils but with hydrophytes (aquatic beds and seaweed-covered rocky shores); and (3) areas without soil and without hydrophytes (gravel beaches and tidal flats) that are periodically flooded. The FWS definition generally does not include permanent deep-water areas as wetlands. However, permanent shallow waters that commonly support aquatic beds and emergent plants (erect, rooted, nonwoody plants that are mostly above water) are classified as wetlands. In the 1960's and 1970's, State and Federal environmental laws gave some protection to wetlands. On the basis of different interests to be protected, however, each governing body developed a different definition of wetlands. Examples of some of these definitions are given in table 2. Only wet soils vegetated with hydrophytes are considered as wetlands by the three Federal agencies involved with regulation--the SCS, the U.S. Environmental Protection Agency (EPA), and the U.S. Army Corps of Engineers (Corps). The FWS uses a nonregulatory definition that is Broader and includes aquatic beds in shallow freshwater and naturally nonvegetated areas. In the context of vegetated wetlands, all four agency definitions are conceptually the same in that they include hydrology, vegetation, and soils. Most States have developed regulatory definitions to protect certain wetlands from exploitation. Therefore, State definitions are much Broader than any of the Federal definitions. The State definitions tend to emphasize the presence of certain plants for identification purposes (table 2). However, the States did not produce a comprehensive list of "wetland plant species," making it difficult to use vegetation consistently to identify the limits of wetlands (Tiner, 1989 and 1993a). (Cowardin and others, 1979) "Wetlands are lands transitional between terrestrial and aquatic systems where the water table is usually at or near the surface or the land is covered by shallow water. For the purposes of this classification wetlands must have one or more of the following three attributes: (1) at least periodically, the land supports predominantly hydrophytes; (2) the substrate is predominantly undrained hydric soil; and (3) the substrate is nonsoil and is saturated with water or covered by shallow water at some time during the growing season of each year." U.S. Army Corps of Engineers (33 CFR 328.3) U.S. Environmental Protection Agency (40 CFR 230.3) "Wetlands are those areas that are inundated or saturated by surface or groundwater at a frequency and duration sufficient to support, and that under normal circumstances do support, a prevalance of vegetation typically adapted for life in saturated soil conditions. Wetlands generally include swamps, marshes, bogs, and similar areas." the "Swampbuster") "Wetlands are defined as areas that have a predominance of hydric soils and that are inundated or saturated by surface or ground water at a frequency and duration sufficient to support, and under normal circumstances do support, a prevalence of hydrophytic vegetation typically adapted for life in saturated soil conditions, except lands in Alaska identified as having high potential for agricultural development and a predominance of permafrost soils." inclusive, 1972, 1987) "Wetlands mean land, including submerged land which consists of any of the soil types designated as poorly drained, very poorly drained, alluvial, and floodplain by the National Cooperative Soils Survey, as may be amended from time to time, by the Soil Conservation Service of the United States Department of Agriculture. Watercourses are defined as rivers, streams, brooks, waterways, lakes, ponds, marshes, swamps, bogs, and all other bodies of water, natural or artificial, public or private." as amended June 28, 1983) "Coastal wetlands include salt marshes and freshwater or brackish wetlands contiguous to salt marshes. Areas of open water within coastal wetlands are considered a part of the wetland. Salt marshes are areas regularly inundated by salt water through either natural or artificial water courses and where one or more of the following species predominate:" (8 indicator plants listed). "Contiguous and associated freshwater or brackish marshes are those where one or more of the following species predominate:" (9 indicator plants listed). Sections 2-1-18 et seq.) Fresh water wetlands are defined to include, "but not be limited to marshes; swamps; bogs; ponds; river and stream flood plains and banks; areas subject to flooding or storm flowage; emergent and submergent plant communities in any body of fresh water including rivers and streams and that area of land within fifty feet (50') of the edge of any bog, marsh, swamp, or pond." Various wetland types are further defined on the basis of hydrology and indicator plants, including bog (15 types of indicator plants), marsh (21 types of indicator plants), and swamp (24 types of indicator plants plus marsh plants). Section 13:18-1 to 13:29.) "Wetlands are those lands which are inundated or saturated by water at a magnitude, duration and frequency sufficient to support the growth of hydrophytes. Wetlands include lands with poorly drained or very poorly drained soils as designated by the National Cooperative Soils Survey of the Soil Conservation Service of the United States Department of Agriculture. Wetlands include coastal wetlands and inland wetlands, including submerged lands." "Coastal wetlands are banks, low-lying marshes, meadows, flats, and other lowlands subject to tidal inundation which support or are capable of supporting one or more of the following plants:" (29 plants are listed). "Inland wetlands" are defined as including, but not limited to, Atlantic white cedar swamps (15 plants listed), hardwood swamps (19 plants specified), pitch pine lowlands (10 plants listed), bogs (12 plants identified), inland marshes (6 groups of plants listed), lakes and ponds, and rivers and streams. Section 13:18-1 to 13:9A-10) "Coastal wetlands" are "any bank, marsh, swamp, meadow, flat or other low land subject to tidal action in the Delaware Bay and Delaware River, Raritan Bay, Sandy Hook Bay, Shrewsbury River including Navesink River, Shark River, and the coastal inland waterways extending southerly from Manasquan Inlet to Cape May Harbor, or at any inlet, estuary, or those areas now or formerly connected to tidal areas whose surface is at or below an elevation of 1 foot above local extreme high water, and upon which may grow or is capable of growing some, but not necessarily all, of the following:" (19 plants are listed.) Coastal wetlands exclude "any land or real property subject to the jurisdiction of the Hackensack Meadowlands Development Commission...."
Chapter 131, Section 40) "The term 'freshwater wetlands' shall mean wet meadows, marshes, swamps, bogs, areas where groundwater, flowing or standing surface water or ice provides a significant part of the supporting substrate for a plant community for at least five months of the year; emergent and submergent plant communities in inland waters; that portion of any bank which touches any inland waters." Various wetland types are further defined on the basis of hydrology and indicator plants and include bogs (19 types of indicator plants), swamps (22 types of plants), wet meadows (12 types of plants), and marshes (22 types of indicator plants). "Wetland classification," as used in this article, refers to the designation of different wetland types on the basis of hydrology, vegetation, and soils. The Federal Government's early attempts to classify wetlands were motivated largely by agricultural interests that sought to convert wetlands to cropland. The first classification systems put wetlands into a few general categories on the basis of location--river swamps, lake swamps, and upland swamps (Wright, 1907). Other classification systems were related to the degree of inundation--permanent swamps, wet grazing land, periodically overflowed land, and periodically swampy land (Dachnowski, 1920). Later wetland classifications developed from a need to differentiate wetlands from other land-cover types for regional and national planning purposes, or because of ecological interest. Martin and others (1953) developed a "Classification of Wetlands in the United States" to serve as a framework for the 1954 national inventory to assess the amount and types of wetland waterfowl habitat. Although this system is still in use, the inadequate definition of wetland types has led to inconsistencies in application across the country (Cowardin and others, 1979). On the basis of these objectives, the FWS developed a new wetland classification system. The system was extensively field tested and reviewed by public and private sectors before being published as "Classification of Wetlands and Deepwater Habitats of the United States" (Cowardin and others, 1979). Since its publication, the system has become the national and international standard for identifying and classifying wetlands (Mader, 1991; Gopal and others, 1982). A synopsis of the FWS wetland classification system is presented here. Each of the State summaries in this volume gives a general summary of the system, and a more comprehensive discussion can be found in Cowardin and others (1979). The system described here proceeds from general to specific, as shown in figure 15. The overwhelming majority of the Nation's wetlands fall within the Palustrine System; most of the remaining wetlands are in the Estuarine System. Subsystem.--Each system, except the Palustrine, is divided into subsystems (fig. 15). The Marine and Estuarine Systems have two subsystems that are defined by tidal water levels: subtidal--continuously submersed areas; and intertidal--alternately flooded and exposed to air. The Lacustrine System has two subsystems that are defined by water depth: littoral--the shallow-water zone where wetlands extend from the lakeshore to a depth of 6.6 feet below low water or to the extent of nonpersistent emergent plants such as arrowheads, pickerelweed, wild rice, or bulrush, if they grow beyond that depth; and limnetic--the deepwater zone where low water is deeper than 6.6 feet (deepwater habitat). The Riverine System has four subsystems that represent different reaches of a flowing freshwater system: tidal--water levels subject to tidal fluctuations; lower perennial--permanent, slow-flowing waters having a well-developed flood plain; upper perennial--permanent, fast-flowing waters having very little or no flood plain; and intermittent--streambeds with flowing water for only part of the year. Figure 15. Classification hierarchy of wetlands and deepwater habitats showing systems, substystems, and classes. Source: Cowardin and others, 1979). 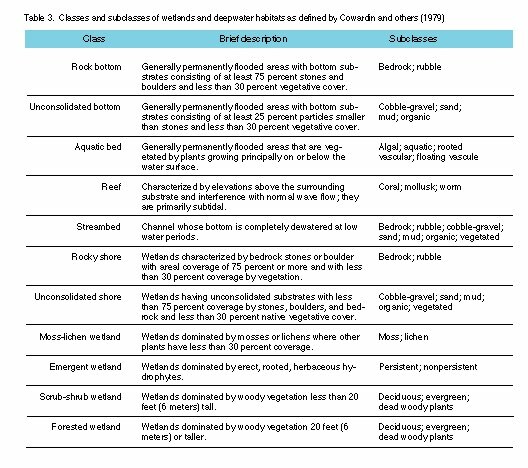 Classes.--Each subsystem is divided into classes, which describe the general appearance of the wetland or deepwater habitat in terms of the dominant vegetative form, or composition of the substrate (table 3). For areas where vegetation covers 30 percent or more of the surface, five vegetative classes are used--aquatic bed, moss-lichen wetland, emergent wetland, scrub-shrub wetland, and forested wetland. Aquatic beds may be either wetlands or deepwater habitats, depending on water depth. Table 3. Classes and subclasses of wetlands and deepwater habitats as defined by Cowardin and others (1979). Six other classes are used where vegetation generally is absent and where substrate and degree of flooding are distinguishing features--rock bottom, unconsolidated bottom, reef, streambed, rocky shore, and unconsolidated shore. Areas that are nonvegetated and permanently flooded are classed as either rock bottom or unconsolidated bottom. Areas that are periodically flooded are classed as streambed, rocky shore, or unconsolidated shore. Reefs are found in both permanently flooded (deepwater habitats) and periodically flooded tidal areas (wetlands). Subclass.--Each class is divided further into subclasses (table 3) to define the substrate in non-vegetated areas or the dominant vegetation in vegetated areas. In vegetated areas, the subclasses are--persistent or nonpersistent emergents, mosses and lichens, or BRoad-leaved deciduous, needle-leaved deciduous, BRoad-leaved evergreen, needle-leaved evergreen, and dead woody plants. In nonvegetated areas the subclasses are--bedrock, rubble, cobble-gravel, mud, sand, and organic. Dominance Type.--Below the subclass, dominance type can be applied to specify the dominant plant or animal in the wetland. This level allows one to distinguish between distinct plant communities (red maple forested wetland and pin oak forested wetland, or a tussock-sedge-dominated emergent wetland and cattail-dominated emergent wetland). In this way, individual wetlands can be grouped in ecologically similar units. Modifiers.--The classification system also uses modifiers to describe hydrologic, chemical, and soil characteristics, and the effects of humans on the wetlands. The four specific modifiers used are--water regime, water chemistry, soil, and special. These modifiers can be applied to classes, subclasses, and dominance types. 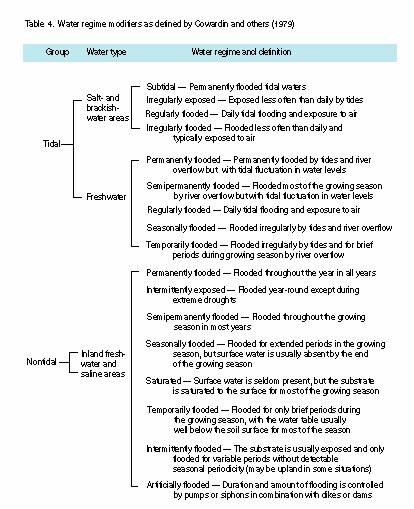 The water-regime modifiers describe flooding or soil saturation and are divided into two main groups--tidal and nontidal. Tidal modifiers can be subdivided into two general categories--salt- and BRackish-water and freshwater. The nontidal modifier--inland freshwater and saline--defines conditions where runoff, ground-water discharge or recharge, evapotranspiration, wind, and lake seiches (oscillation of the water) cause water-level changes. Both tidal and nontidal modifiers are BRiefly defined in table 4. Table 4. Water regime modifiers as defined by Cowardin and others (1979). Water-chemistry modifiers are divided into two categories: salinity and pH. The salinity modifiers have been further divided into two groups: haline for estuarine and marine tidal areas dominated by sodium chloride and saline for nontidal areas dominated by salts other than sodium chloride. The salinity and fluctuations in salinity of water in a wetland and the type of salt causing the salinity determines what plant and animal species the wetland can support. The pH modifiers identify waters that are acid (pH less than 5.5), circumneutral (pH 5.5-7.4), and alkaline (pH greater than 7.4). Soil modifiers are divided into two categories--organic and mineral. In general, if a soil has 20 percent or more organic matter by weight in the upper 16 inches, it is considered an organic soil. If it has less than this amount, it is a mineral soil. Special modifiers are used to describe human or beaver activities. These modifiers are: excavated, impounded (obstruct outflow of water), diked (obstruct inflow of water), partly drained, farmed, and artificial (materials deposited by humans to create or modify a wetland). Although an extensive treatment of wetlands is beyond the scope of this article, it would be incomplete without examples of the classification of some of the different wetland types. In figure 16, some of the major wetland types are listed by their common names and then classified by the FWS system. The variety of wetlands and their locations also are illustrated. For further information on wetland types, see Mitsch and Gosselink (1986), Niering (1984), Tiner (1984, 1987, 1993b), and Wilen and Tiner (1993). The FWS wetland classification system has provided a uniformity of wetland terminology. The FWS wetland classification system places ecologically similar habitats into a hierarchal system that permits wetland classification down to dominance types, which are based on dominant plants or substrates. The system can be used to identify units for inventory and mapping for Federal and State wetland inventories. It also has provided a uniformity of wetland terminology. The FWS uses this classification to determine wetland status and trends--information useful to resource managers and planners at all levels of government. Since the 1954 inventory by the FWS, wetlands have changed because of natural and human-related activities. Wetland characteristics and values have become better defined, more widely known, and more appreciated. As a result, Federal and State legislation has been passed to protect wetlands, and some States have completed wetland surveys (Cowardin and others, 1979) to aid in protecting and managing this resource. Classification of wetlands and deepwater habitats of the United States: U.S. Fish and Wildlife Service Report FWS/OBS-79/31, 131 p.
Peat deposits in the United States and their classification: Soil Science, v. 10, no. 6, p. 453-456. Wetlands--Ecology and management, in Proceedings of the First International Wetlands Conference, September 10-17, 1980, New Delhi, India: Jaipur, India, National Institute of Ecology and International Scientific Publications, 514 p.
Inland wetland definitions: Storrs, Conn., University of Connecticut., Institute of Resources, Report 28, 63 p.
Forested wetlands classification and mapping--A literature review: New York, N.Y., National Council of the Paper Industry for Air and Stream Improvement, Inc., Technical Bulletin no. 606, 99 p.
Classification of wetlands of the United States: Washington D.C., U.S. Fish and Wildlife Service Special Scientific Report, Wildlife, no. 20, 14 p.
Wetlands: New York, N.Y., Van Nostrand Reinhold Co., Inc., 539 p.
Wetlands: New York, N.Y., Alfred A. Knopf, Inc., 638 p.
National list of plant species that occur in wetlands--National summary: Washington, D.C., U.S. Fish and Wildlife Service Biological Report, v. 88, no. 24, 244 p.
National wetland classification and inventory workshop, July 20-23, 1975, College Park, Md., University of Maryland, Proceedings: Washington, D.C., U.S. Fish and Wildlife Service Report, 358 p.
Wetlands of the United States--Current status and recent trends: Washington, D.C., U.S. Fish and Wildlife Service Report, 59 p.
A field guide to coastal wetland plants of the northeastern United States: Amherst, Mass., University of Massachusetts Press, 285 p.
Wetland boundary delineation, in Majumdar, S.K., BRooks, R.P., BRenner, F.J., and Tiner, R.W., Jr., eds., Wetlands ecology and conservation--Emphasis in Pennsylvania: Easton, Pa., Pennsylvania Academy of Sciences, p. 231-248. The concept of a hydrophyte for wetland identification: BioScience, v. 41, no. 4, p. 236-247. Using plants as indicators of wetland: Philadelphia, Pa., Academy of Natural Sciences of Philadelphia, Proceedings, v. 144, p. 240-253. Field guide to coastal wetland plants of the southeastern United States: Amherst, Mass., University of Massachusetts Press, 328 p.
Existing state and local wetland surveys (1965-1975), v. II, Narrative: Washington, D.C., U.S. Fish and Wildlife Service, Office of Biological Services Report, 453 p.
Hydric soils of the United States: Washington, D.C., in cooperation with the National Technical Committee for Hydric Soils, U.S. Department of Agriculture, Miscellaneous publication 1491. Wetlands of the United States, in Whigham, D.F., Dykyjov, Dagmar, and Hejny, Slavomil, eds., Wetlands of the world I: Dordrecht, Netherlands, Kluwer Academic Publishers, p. 515-636. Swamp and overflowed lands in the United States: Washington, D.C., U.S. Department of Agriculture, Office of Experiment Stations, Circular 76, 23 p.
1 The SCS became the Natural Resources Conservation Service in 1994.